Calling for an end to racism and infanticide and a call to return to values of Dr. Martin Luther King and Frederick Douglass. Unity Rally and March for Righteousness and Justice calling for an end to racism, and infanticide and a return to values of Dr. Martin Luther King and Frederick Douglass. Following the march will be a Strengthening the Black Family event at Mount Olivet Church, 1223 North 25th Street, Richmond, VA 23221 from 3:00 PM to 5:00 PM (EST). Strengthening the Black Family is a forum that celebrates the importance of family in the black community while highlighting the challenges facing many of our children due to single parent households, divorce and poverty. Coming from the political and policy world, this leadership training is transforming the lives of participants as they work in the business and political world. 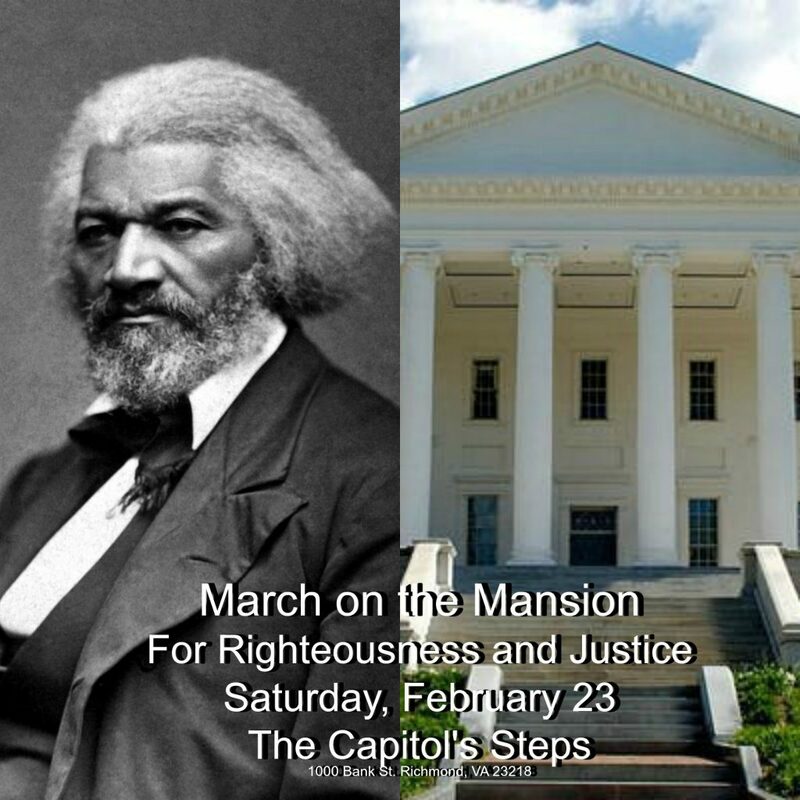 The Andrew Shannon Gospel Music Celebration will be providing passenger buses for professional transportation services for passengers in the Suffolk, Portsmouth, Chesapeake, Hampton, Newport News, Danville, Pittsylvania County, and Halifax County areas for the “March On The Mansion” on Saturday, February 23, 2019. Thank you for your assistance and consideration. Reprinted with the Author’s Permission. Originally published in Bacon’s Rebellion. The protection of a well-connected few will outweigh a possible benefit to the many, which seems to be what always happens when Virginia tries tax reform. In Virginia, Teachers have only one choice for a professional organization to represent them – the Virginia Education Association (a subsidiary of the National Education Association). The VEA has a monopoly on school divisions. It is time Teachers are given a choice of professional organizations and SB1236 gives them that choice! Please contact the following committee members and tell them to support teachers’ rights and vote yes on SB1236. Paradigm shifts are not limited to science or academia, but rather, occur across all types of systems, organizations, and structures – even a nation’s psyche. They are similar to a collective light bulb going off in a group of people’s heads when a better way of doing things comes about. Once adopted, a new paradigm replaces the old and a shift occurs. Competing paradigms exist in other areas of human endeavor, not just science. For example, communism and capitalism have opposed each other since the turn of the 20th Century. However, communism never gained full traction except within the industries related to Hollywood, which it captured in the 1930s and still controls today. This is why actors, actresses, screen writers, and anything Hollywood are so far left. If one wants to work, he or she must be rabidly liberal. See Tinseltown Travelogue, Part 2 for a full expose. A new political paradigm began in the tumultuous 1960s spurred on by dissatisfaction with the Vietnam War, African Americans seeking freedom from oppression at home, and the advent of a baby-boom generation coming into maturity. This was a generation that had no inkling of the horrors of World War II or the deprivation of The Great Depression. This new paradigm was based upon the concepts of social justice, communal sharing, and egalitarianism. It took hold and grew to significant proportions. Socialism was a major tenet and presented a softer face than communism. Redistribution of wealth was easier to sell to impoverished citizens. Ironically as America has accumulated huge wealth, it has squandered it due to the increased size of government and irresponsible spending. Our national debt has grown out of control and threatens the viability of America. There is no end to the spending or borrowing. Today, politicians offer Medicare-for-All while the present system is due to go bankrupt in about ten years. The U.S. Government has spent huge amounts of money on the Federal Department of Education since its establishment in the 1960s, yet the educational achievements of our children have steadily deteriorated from 1st to 17th in the world. Open borders and unlimited illegal immigration are touted as good for America, regardless of the costs. The power of an un-elected Deep State has grown and hides within a bloated federal government as it challenges our elected institutions. It appears that Hillary Clinton illegally sold uranium assets to the Russians for which she has never been held accountable. She is presently at the center of a silent coup to overturn a duly-elected president. Fake News abounds and the mainstream media promotes its favored political parties and causes. The list goes on. However, with the election of President Donald J. Trump a massive paradigm shift may be occurring that will supplant the established order favoring big government and wanton spending. Had Hillary Clinton been elected president, a totalitarian state based upon radical-socialist principles would have been realized. But she didn’t win, her dream of the presidency was crushed, and the progression toward a communist America was halted. This is why the Democrat Party is reacting with such vengeance and pulling out all the stops with false accusations and acts of physical aggression towards duly-elected members of Congress or anyone disagreeing with them. It is all in reaction to their loss of power and control and they want it back.